Teacher teams should have a common vision for what "success" means for their students. EssayTagger collects and analyzes a ton of data which can be used to create consistent expectations across the teacher team. Whenever you grade an assignment in EssayTagger you end up with an assortment of data reports that provide a deeper insight into how your students performed, based on your evaluations. That's all well and good, but what is the relevance to teachers operating in a team-based approach? What does the rest of the Sophomore English team care about the results from my two Soph Eng sections? Maybe I find that my sections are doing reasonably well on Thesis but are still developing their skills with Counterclaims. Are the other Soph Eng teachers seeing the same thing with their students? If so, we can talk about strategies to improve their work with addressing the opposing viewpoint. Or perhaps we'll find that my Thesis results look stronger than the other teachers' results. Now things get interesting. Am I doing something awesome that's really working with my kids or am I just grading their theses too generously? I can have EssayTagger pull up the actual text of my students' theses, sorted by each quality level in the rubric and organized by the feedback comment I gave them when I evaluated their essays. My team and I can look these over and discuss how we feel about the quality level determinations I made. Was I too generous? Was I spot-on? Similarly the other members of the team can pull up some of their samples and we can openly discuss expectations and quality level determinations. 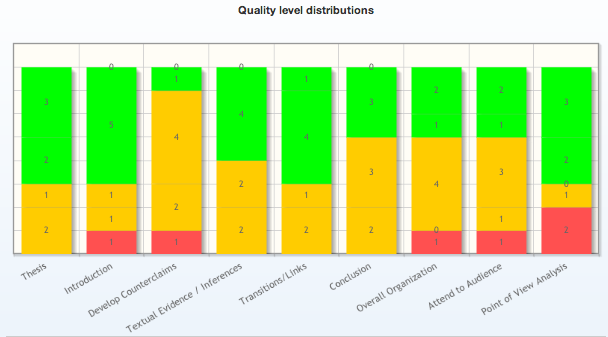 As a group we can decide what really constitutes a "Good" thesis or "Proficient" evidence. We can set the bar at an appropriate level so that we all know what we're aiming for. Another great use for this sort of data is to bring new team members up to speed and get their expectations in line with the team's. Have the team select a number of sample essays and ask the new team member to grade them in EssayTagger. Then do the same sort of review and discussion to get everyone on the same page. True teaching professionals will understand that this kind of sharing and discussion is vital. Too often the education culture is built around an invisible barrier that starts at the classroom door; sure, we'll discuss common learning targets and maybe even common assessments, but once you're in your classroom, it's your business and yours alone. It's almost like a sacred, protected space that no other teacher dare intrude upon. Those days are over, my friends, and we'll all be better off when we can embrace a more open, more transparent approach to team collaboration and coordination. "It's so unfair, I got the hard teacher"
We've all heard this. Students always know who the hard teachers are, who the pushovers are. But as teaching becomes more collaborative and more coordinated across a teacher team we should be hearing less and less of this. We will never have standardized experiences--every teacher brings his or her own flair to the classroom and the material (and that's a good thing!) --but we absolutely should have standardized expectations for all sections of the same course, regardless of the instructor. EssayTagger's data collection, organization, and reporting can help make that happen. But we can't force you and your team to take that next step. The power is--and always will be--in your hands.